Automatic Transfer Switch is a brand-new intelligent dual power ATS with the selections of 250A, 315A, 350A, 400A, 500A, 630A of rated operational current, adjustable 0~30s delay time. It is a safe and reliable switch to transfer the power sources in many critical areas. Selectable rated working current 250A, 315A, 350A, 400A, 500A, 630A. Used for the mutual conversion between normal power supply (N) and standby power (R) in the emergency power supply system (can also be set to manually operate). Used as a switch to control the circuit with the use of controlling, signaling, interlocking etc. Small size, light weight, stable operation, and easy to use. Keyboard input and LCD display of the intelligent controller. Take 3s to enter into the protection state of dual power OFF from cutting off the abnormal power, and then transfer to a normal power supply by 0~30s delay time. Suitable for residential areas, military facilities, hospitals, shopping malls, airports and so on. Relative Humidity RH≤50% @ +40℃; at a lower temperature, it is allowable to have a higher humidity. Please pay more attention to the condensation produced on the product surface with the change of humidity. Installation No explosive medium, and no medium of gas and dust is enough to corrode and damage the insulation. No significant shock and vibration. *The above wiring diagram is just for your reference. With the different types and functions, the wiring is also different. *When the fire takes place, EPS signal is on (provided by firefighting center) and the circuit breakers Q1 & Q2 is released or cut off. *Q1 & Q2 refer to circuit breakers. *KG refers to the wiring terminals. 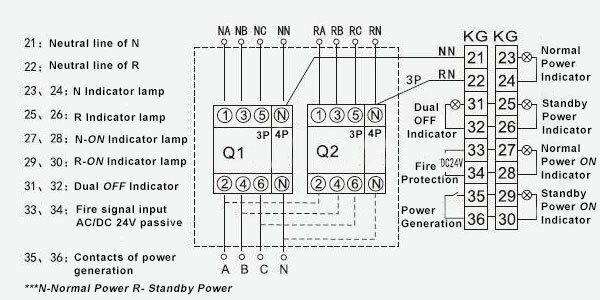 *The R & N power ON indicator lamps are external (provided by users). *The dashed part is supplied by users. Tips: Automatic transfer switch trips but the light is on, how to do? Transportation causes the tripping of ATS circuit breakers. In the usage, the ATS circuit breaker trips. 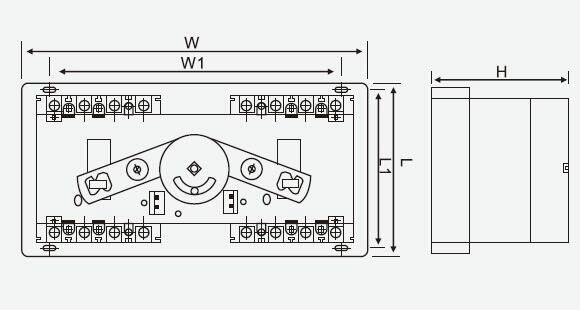 If it is caused by transportation, reconnect the molded case circuit breaker by hand, and then changeover to automatic position meanwhile press the reset key. If the tripping is caused in the use, first check the load conditions of circuit breaker. If tripping is the cause by short circuit, first troubleshoot the short circuit and then transfer switch manually or automatically. During the troubleshooting of short-circuit fault, manual or automatic changeover is not allowed, which may cause secondary short circuit or personal injury. In the case of tripping under overload conditions, first check the load of the electrical equipment, and check whether the rated current of the molded case circuit breaker of the ATS can meet the load. If not, replace the molded case circuit breaker as much as possible. Otherwise, the circuit breaker will frequently trip, which causes burnout of the circuit breaker static and movable contacts and affects the power supply system.